Envisioned as a 100-mile long-distance trail from the Connecticut River to the Hudson River, the Mahican – Mohawk Recreation Trail follows the corridor of the historic Native American path along the Deerfield River, over the Hoosac Mountains and along the Hoosic River. Traveling east to west, as the sun rises and sets, this recreational trail recalls the historic route even traversing the original trail atop Todd Mountain in Mohawk Trail State Forest. Along the way, the Mahican – Mohawk Trail links together historic sites, vibrant town centers, stunning views, scenic landscapes and spectacular forests. It offers users the opportunity to travel from river’s edge to mountain ridge to river’s edge again. Today, approximately 30 miles of the trail are open and designated in Massachusetts on former rail corridor, woodland path, and rural roads. An additional 10 miles can be paddled as a water trail on the Deerfield River. Although primarily envisioned as a hiking trail, different segments are also appropriate for biking, snowmobiling, horseback riding, and paddling. From thousands of years ago, Native American groups traveled between the Hudson and the Connecticut valleys along a route that followed the Hoosic River, across the Hoosac Mountains, and along the Deerfield River. Although likely used by a variety of native peoples, it became known as the Mohawk Trail, probably because the Mohawks of present-day New York State traversed it to reach the Pocumtucks who lived in what is now Deerfield for a 1664 battle. Sections of the footpath were created as part of the licensing for hydropower along the Deerfield. The rebirth of the trail as a whole began in 1992, when a group of Williams College students explored the history and path of the trail and assessed its feasibility. The Mahican-Mohawk Recreational Trail today follows the original corridor where possible, including traversing a portion of the original Native American trail atop Todd Mountain in Mohawk Trails State Forest. The Mahican – Mohawk Trail today begins at Historic Deerfield. Originally settled by English farmers around 1670, Deerfield is now both a modern community and an “open-air museum” that preserves and interprets the architecture, artifacts and lifestyle of an early New England town. The trail follows rural roads for a short time before coming to the trailhead at Hoosac Road, where it picks up the former railroad bed of the New Haven and Northampton Railroad. The trail then heads up the scenic Deerfield River Valley on the railroad bed. Within the first two miles there are three optional woodland loops to the right that bring hikers closer to the river. At the confluence of the Deerfield and the South Rivers, the trail crosses the steep-sided South River at the site of what was a once 175-foot high 550-foot long steel railroad bridge (the highest in southern New England). Today, the trail crosses the river on a fiberglass pedestrian bridge known as Polly’s Crossing in honor of its instigator. After another 2.5 miles, the trail emerges on Bardwell’s Ferry Road and crosses the Deerfield River on the Bardwell’s Ferry bridge. From Bardwell’s Ferry Bridge, the trail follows the PanAm Southern Railroad west for 300 yards before plunging to the right onto a woodland path. This section of the trail is rugged in places, crossing several beautiful streams and with many ups and downs. 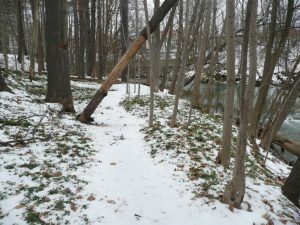 The trail passes river access for small boats at Wilcox Hollow before continuing across Franklin Land Trust land, climbing up to a trailhead at a pullout on Route 2. From there, it is only a short on-road walk to the Village of Shelburne Falls, the home of the Salmon Falls with its Potholes (a Native American summer encampment) and the Bridge-of-Flowers. Notice, Portions Closed: Bardwell’s Ferry Bridge to Route 2 in Shelburne, sections of the trail have been posted approximately 2.5 miles from Bardell’s Ferry or 1.5 miles from the Route 2 pull-out. Hikers cannot complete a through hike. Please plan a round trip accordingly. The trail from Shelburne Falls to Charlemont does not currently exist on-the-ground, but follows the course of the Deerfield River itself or Route 2. Paddlers can canoe or kayak this stretch from the village of Charlemont downstream to a boat launch on Route 2 near the Buckland town border. The route of the trail here passes near the Taylor Fort site, built by Otheniel and Jonathan Taylor in 1754, and then the home of Underground Railroad agent, Hart Leavitt, who hid former slaves fleeing southern states on their way to Canada. Moses Rice, the first settler of Charlemont, had his home just east of Legate Brook’s intersection with the Deerfield River, and his son built the Rice Fort east of here in 1754. From Charlemont, the route crosses the Deerfield River on Route 2 and passes by the Hail to the Sunrise statue, erected in 1932 by the Councils of the Improved Order of Red Men to commemorate the Mohawk Indians. here hikers walk in the footprints of the original American inhabitants. The tread here has remained a documented trail since the 1600s, likely dates from thousand of year before that, and may be unique as a cultural resource in this respect. The forest is also the location of Indian Spring, a resting place for many tribes before heading up Todd Mountain. Beyond its cultural and historic appeal, the Mohawk Trail State Forest is extraordinary for its forest resources. Several groves of Civil War-aged white pines have matured to become the tallest trees in New England. Currently, there are 15 Mohawk pines surpassing 160 feet in height, and at least 135 now surpass 150 feet. Based on measurements taken by the Native Tree Society, this is the largest population in New England, if not the entire Northeast of trees meeting the 150-foot height threshold. The single tallest tree in New England, the Chief Jake Swamp White Pine, is 173.0 feet as of the latest measurement. A second tree named Saheda, after a Mohawk leader, just makes 170 feet. It is New England’s second tallest tree. The trail passes near many of these exceptional pines, offering hikers with a woodland aesthetic not easily matched elsewhere. Mohawk Trail State Forest also includes the largest area of old growth forest in Massachusetts, some 560 acres that include trees up to 500 years old. Close to a dozen species of trees exceed 300 years in age to include a 334-year old black birch, the seventh oldest known of its species. From the Todd – Clark Mountain ridge, the trail now (completed in 2012) travels through a variety of woodlands – beech, laurel, pine, spruce, hemlock – crosses Wheeler Brook and occasionally passes old cellar holes and homesteads as it makes its way toward Route 2 near South County Road in Drury – Florida. On the south side of Route 2 in Drury, the trail heads into Savoy Mountain State Forest crossing two lumber bridges and several bog bridges as it makes it way down to the Cold River. In low water the river is easily forded, but in high water it may be un-crossable. The path then climbs steeply to Sherman Road where it now follows existing roads and trails through the state forest to South Pond, the Savoy Mountain Campground. The route of the Mahican – Mohawk Trail then follows the existing North Pond Loop, Blackburnian Loop and Lost Pond Trails to the top of Spruce Hill where hikers are treated to stunning views of the Mount Greylock, North Adams and the entire north Berkshire region. From Spruce Hill the trail traverses the Hoosac Range on a section built and managed by the Berkshire Natural Resources Council to a trailhead at the Western Summit on Route 2. Along this section it crosses over the Hoosac Tunnel. Built between 1851 and 1875 under the Hoosac Mountains for train service between Boston and Troy, the tunnel is 4.75 miles long, the longest in North America upon completion, costing $15 million and 195 lives. The final leg of the currently designated trail comes down off the Hoosac Range above North Adams, over a trail that was part of the gravel road preceding the modern highway, and landing at another trailhead on Route 2. The trail then goes on-road to the doors of Mass MOCA, the Museum of Contemporary Art. At the junction of the north and south branches of the Hoosic River, the museum was formerly the Sprague Electric Company and textile mills. In North Adams, the trail will follow a proposed bike path west, passing near the site of Fort Massachusetts. The fort was built in 1741 on the Mohawk Trail to assert the Bay Colony’s rights against the French and their Indian allies, as well as to claim the western boundary against inroads by New York. The bike path will bring this remarkable trail to Williamstown, Massachusetts, before continuing north and west to Vermont and New York where volunteers are also working to re-develop this historic trail. 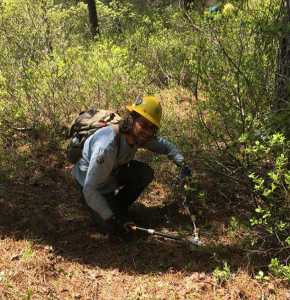 Although envisioned as a 100-mile trail, roughly 40 miles are currently designated in Massachusetts, and some of these are on road, on water, or not well marked or developed. Notice on the above sections: Bardwell’s Ferry Bridge to Route 2 trailhead in Shelburne, sections of the trail have been posted approximately 2.5 miles from Bardwell’s Ferry or 1.5 miles from the Route 2 pullout. Hikers cannot complete a through hike. Please plan a round trip accordingly. Paddling the River between Charlemont and Buckland: Visitors can paddle this section of the trail on the Deerfield River itself from the Shunpike Rest Area to the boat ramp in Buckland just upstream of the #4 Deerfield dam and across Route 2 from the Big Indian Shop. This trip is nearly 10 miles and takes most people about 2 hours to paddle. The water is mostly class I with some class II. Boating outfitters include Zoar Outdoor and Crabapple Whitewater. Information about water releases and river levels is available from The Waterline. Mohawk Trail State Forest: Trail maps are available at the contact station. The trailhead is to the right immediately after the bridge at the park entrance. It follows a wood road along the Cold River before diving into the woods on the left. This can be difficult to find so keep an eye out for blazes. The trail continues through the forest until it picks up the Nature Trail across the upper meadow and then heads into a lovely pine forest before a long climb up the side of Todd Mountain. This section of the trail is approximately 3 miles to the summit of Todd Mountain and the original stretch of Native American trail. Hikers can return to the park headquarters via the Indian Trail for a loop. Route 2, Drury: Just east and downhill from South County Road in Drury – Florida, the trail crosses Route 2. Parking can be limited here. Please do not park at Brown’s Garage. On the north side, the trail follows a logging road into the forest before branching off toward Todd and Clark Mountains. The trail is approximately 4.5 miles to the Todd Mountain lookout. Route 2, North Adams: The final, one-mile stretch of woodland path descends the Hoosac Range from the Western Summit to a trailhead and pullout on Route 2 across from Rock Manor Mobile Home Park in North Adams. Berkshire Natural Resources Council: Protects, owns and manages the Hoosac Range and many other properties in Berkshire County. Berkshire Regional Planning Commission: Supports the Mahican Mohawk Trail through regional planning activities. 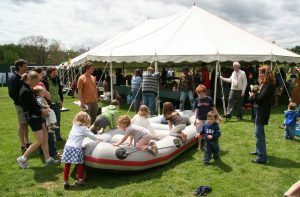 Deerfield River Watershed Association (DWRA): Serves as the stewards of the trail between Deerfield and Shelburne Falls. 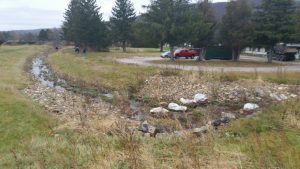 Friends of the Mohawk Trail State Forest: Support efforts to promote and improve the State Forest. The Towns of Deerfield, Conway, Shelburne Falls, Buckland, Charlemont, Florida, North Adams and Williamstown. Respect the rights of private property owners who have generously granted permission for public access to their property. At trailheads, park in designated areas only. Do not park on private property. Carry in/carry out all food and garbage. Do not litter. Please stay on the trail and use steps where provided. Respect all signs, including ‘no trespassing,’ allowed uses and regulatory signs. Please be sensitive to all natural and cultural resources.